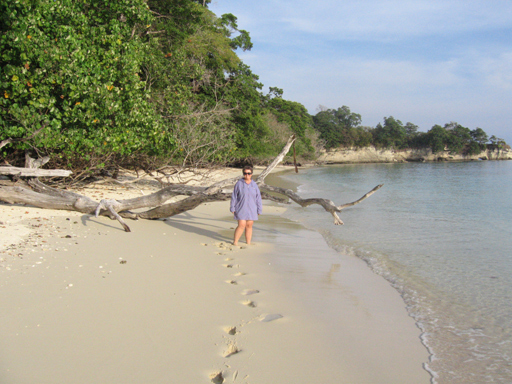 The cruising plan this year was to visit the Andaman Islands of India. 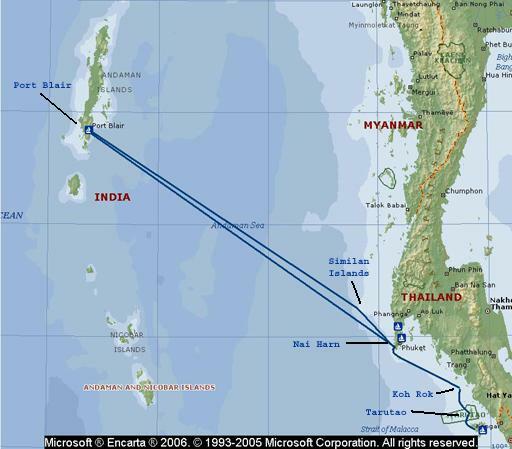 In 2004/2005 during the trip from Turkey to Thailand we had planned a stop in the Andamans. 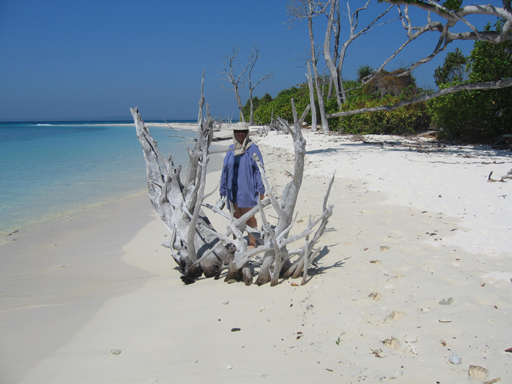 However, the damage suffered by both Callisto and the islands during the Tsunami of 26 Dec. 2004 ruined our appetite for the visit. This year we would finally get our visit in. 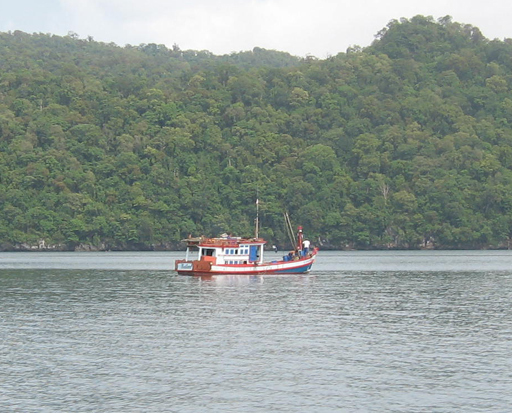 There were three overnight anchorages to Phuket Thailand and then the three day sail to Port Blair in the Andamans. One ill effect of our delayed departure from Langkawi was the wind or more correctly the lack of the wind. The NE monsoon usually provides both clear skies and a good sailing breeze during the months of January and February. The SSB installation delayed our departure until the last day of February and by then the NE monsoon was waning. We still had sunny days and beautiful clear nights, but very little sailing. The moon was full or nearly so for the whole trip which always adds enjoyment to a night passage. 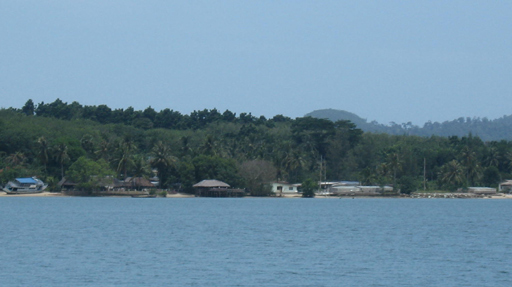 On arrival in the islands one is required to stop at Port Blair for the formalities. On the morning of 7 April, the harbor master granted Callisto permission to enter port and directed us to anchor in Ranger Flats in the main harbor. This is about a mile from the landing from which first customs and then immigration officials were to be picked up in our small dinghy and brought out to the boat for our check-in. After both of these groups have completed their formalities Captain Walt (only the ships captain is allowed ashore before formalities are complete) was allowed to go to the harbor masters office and get our itinerary (shown left) approved. Following that we had to wait for a Coast Guard visit which wasn’t complete until 17:00 in the afternoon. The next day we went into Port Blair to buy diesel and check out the fresh provisions available. 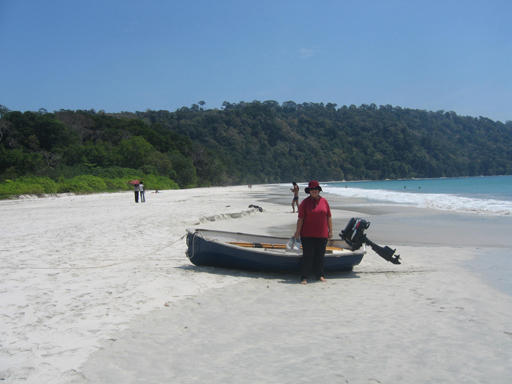 The Andamans, tucked away in the northern part of the Bay of Bengal, don't yet have high rise hotel resorts backing every beach and throngs of tourists staking claim to every square meter of available sand. They may well have these things in the future, but for now there are many uninhabited islands with white sand beaches backed by tropical jungle and fringed with coral gardens. 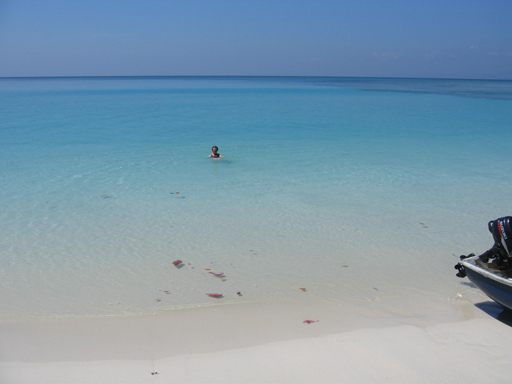 The first stop after Port Blair was Havelock Island, which is inhabited and tourists are flown in from mainland India. Even so their numbers are comparatively small and you can still find yourself virtually alone on a beach rated as the best in Asia and sixth best in the world. There is a gap in the reef that guards the northern end of the beach, which provides a protected pool of clear water ideal for swimming. 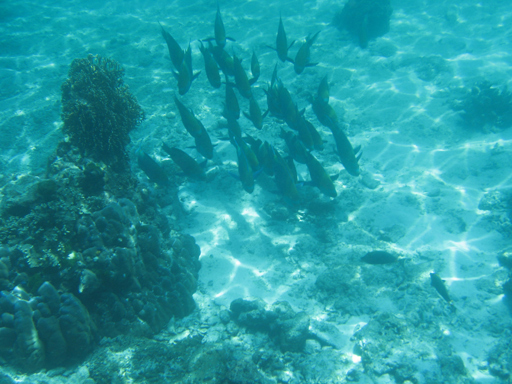 The coral reefs on each side of this pool are inhabited by all manner of tropical fish within easy snorkeling range. Sometimes, in the evening, the local fishermen string their nets nearby and row past to look at the foreign yachts anchored off their islands. One of our favorite spots was a small beach on the southwest end of Henry Lawrence Island. 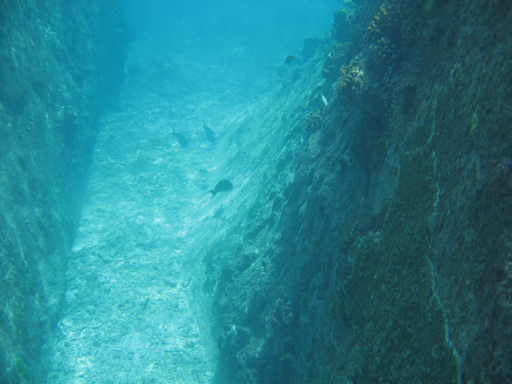 It is fronted by an off lying coral reef only a few feet below the surface and backed by a tropical forest. The only other people around were fellow cruisers on yachts Tui-Tai and Shayile who joined us for a couple of days. Sand on our little beach was fine and soft with pretty sea shells everywhere. The weather was as near perfect as one could wish. Days were hot and sunny, but the water was pleasantly cool and there was usually a cooling breeze drawn down into the boat by our wind scoop. The nights were clear and cool. We slept most nights in the cockpit with only a light covering. North Button Island is also uninhabited, also has a pretty beach and off lying coral gardens. Can one have too much paradise? 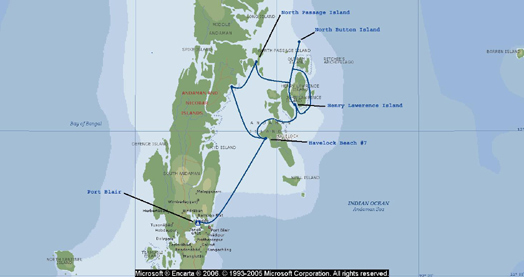 It is probably a good thing that the Indian government limits cruisers to a one month stay, this is an area one could get addicted to. Luckily, Jane could not figure out how to mount this natural drift wood sculpture on the bow. While anchored off North Passage Island this inter-island ferry came by on its regular rounds. It simply had too much character to ignore, a picture seemed necessary. The Indian government does not allow commercial fishing in the waters of the Andaman Islands, as a result the sea life is abundant. 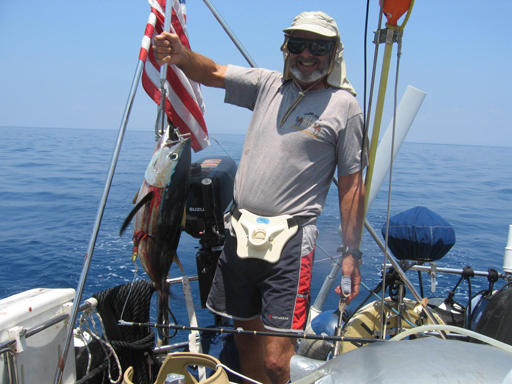 They do allow sport fishing and local fishermen using traditional methods, but no huge trawlers or seiners like we see everywhere else in the world. 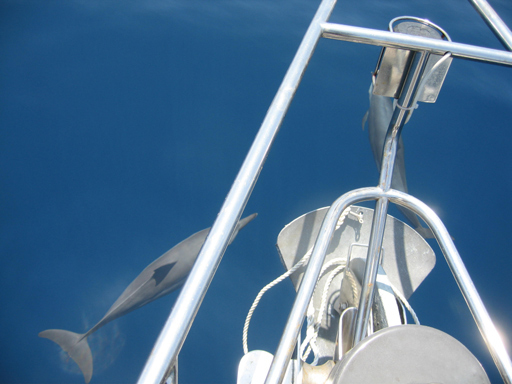 I had just arrived on the bow with the camera to take pictures of a large school of dolphin playing around the boat when Jane called me aft because there was a strike on the fishing line. Even Walt, who is renowned for his lack of fishing skill was able to land a large trevally and this yellow fin tuna, which kept us in fish steaks for the rest of the trip. Unfortunately our engine driven freezer compressor had died a violent death earlier in the trip. This put an end to the fishing, because we already had as much as we could eat. 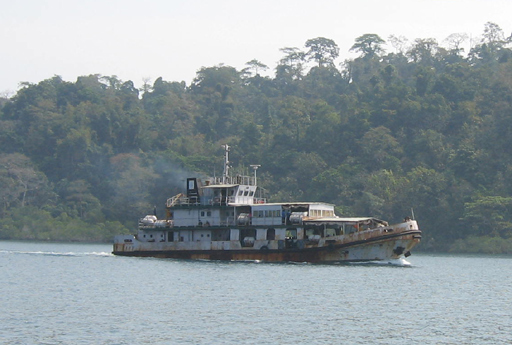 At the end of the visit we had to return to Port Blair to clear out with the officials. We also took a day to top up on fresh fruit, vegetables and diesel fuel. 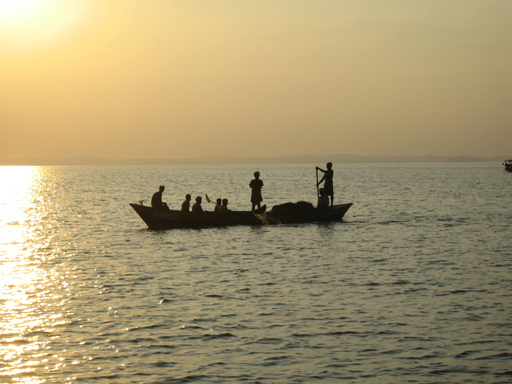 The latter was again done by loading jerry cans transported by taxi and our dingy to the boat. Then it was off for another three day crossing back to the coast of Thailand via the Similan Islands. 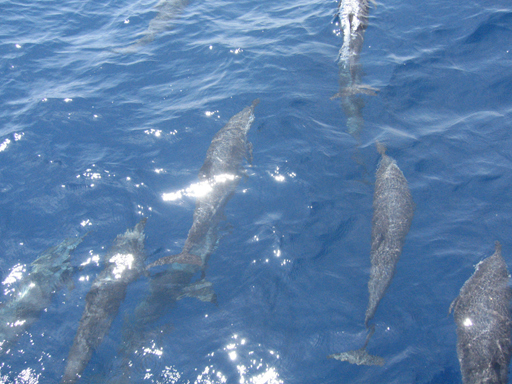 Frolicking dolphin often accompanied Callisto across the Andaman Sea. 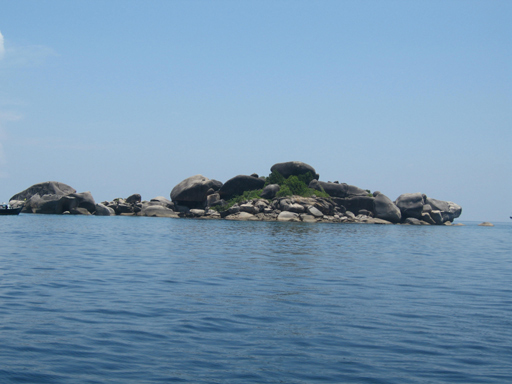 The Similan Islands of Thailand are a group of islands and granite boulders scattered in the sea about 35 miles west of the Thai coast. The government has designated them as a national park and protects them from fishing. The combination of crystal clear water, interesting geology and teeming fish life make this a world renowned scuba dive site. Even with just a snorkel the scenery is magnificent. After a few days playing around in the Similans it was time to find a marina in Phuket before the rainy season set in and get our repairs started. On 7 April we tucked into Yacht Haven Marina as the rainy season clouds were building. It rained the next day and a good many days after that. Yacht Haven is the only all-tide marina in Phuket and it has a beautiful location in the gap between Phuket Island and the Mainland. Now to repair the gen-set. During the trip the outlet pipe from the engine-driven refrig compressor, which is mounted on the gen-set, broke. Loss of lubrication then caused the compressor to self-destruct. Additionally the flex-coupling for the direct driven alternator slipped and the output shaft from the engine would need to be machined. A major job in very tight quarters. 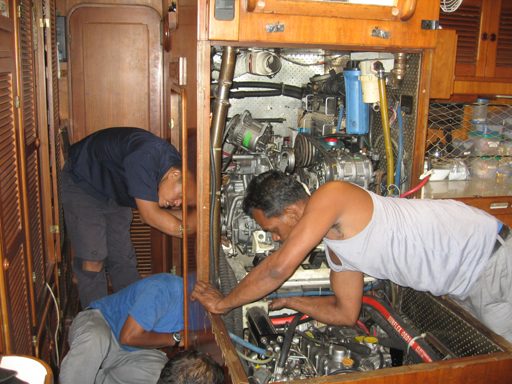 C & C Marine here in Phuket has a good team of mechanics, who were able to get us right in short order once the parts were all assembled. The village located near the near Yacht Haven marina invited the residents and staff to join in on their annual celebration. 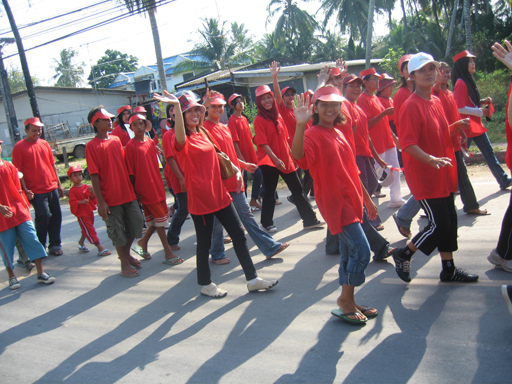 Each of the local communities dons their team colors, there are parades, speeches and various sporting competitions. Walt was roped in to participating in the tug of war for the ad hoc marina team. The yachties won but we think there was a fix in play. A good time was had by all! Songkran is the holiday at the beginning of the Buddhist New Year. Traditionally, part of the celebration involved young people pouring scented water over the hands of their elders and painting their faces with scented powder paste. It represented cleansing for the New Year. In modern times it has degenerated into a time to douse anyone you meet with water in anyway and as much as you can. 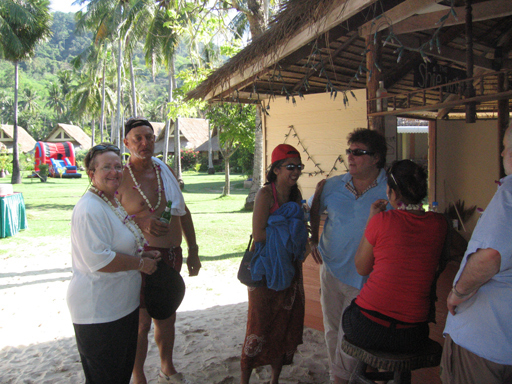 We attended a beach party on the island of Koh Lone, where children in traditional dress blessed us with the traditional hand washing and then we celebrated in a more western fashion with our friends from the sailing catamaran "Bavaria" over food and drink. 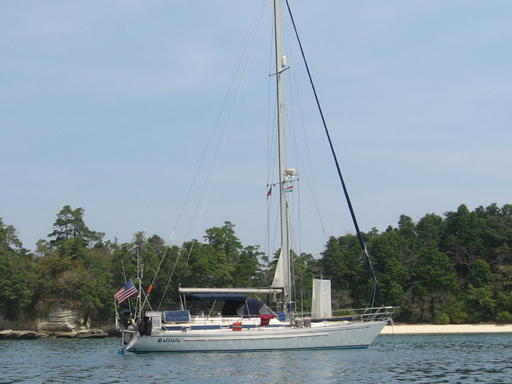 Having completed our repairs and having recovered from a severe lung infections that kept us on self-imposed quarantine for over six weeks, we finally left Yacht Haven in late June. We cleared the marina at slack water and anchored nearby off a small fishing village to get an early start in the morning. The weather in SE Asia is suitable for sailing during most times of the year, but being cooped up in a hot and sticky boat during a torrential down pour is not so much fun even in a lovely anchorage. Neither is being underway in zero visibility during a driving rain storm. We had a short break in the rain and the goal was to make short work of the trip back to Langkawi. As it turned our we still got caught in a driving, zero visibility, rain storm within a hour of Langkawi. One of the reasons we don't like operating at night and during low visibility is fishermen. These guys are everywhere, there are trawlers that pull huge nets along the bottom sweeping up everything on the ocean floor, there are seiners that work in pairs and pull huge nets between them and there are the net layers and trappers. The nets fishermen around here usually lay are weighted so they stand on the bottom with floats to keep one edge up. 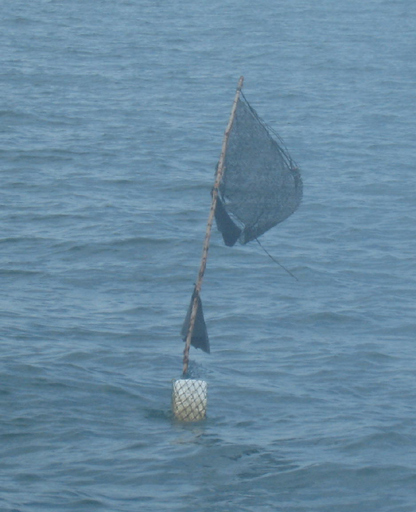 The traps are also on the bottom, but in both cases they mark their fish snares with buoyed markers like the one on the left. These things are everywhere in huge fields like tombstone markers at Arlington on memorial day. They can be difficult to see during the day and impossible at night or in a rain squall. If you are unlucky enough to drive over one, their retrieving line or mooring line can become entangled in your propeller and you are literally hung up. Something we experienced on three occasions in the Chesapeake Bay many years ago, but it still remains fresh in our minds. Callisto is now tucked into Telaga Harbour Marina in Langkawi from where we will launch a driving expedition on the Malay Peninsula and a land tour in India.